The weather this winter has been so unexpected; its January, surely I should be knee deep in snow by now or at least de-icing my car every morning, but no. The temperature in North East England is mild to say the least. Don’t get me wrong, its still cold but its not THAT cold. This does pose as a bit of a problem for me as my wardrobe is stocked full of clothes for the warmest summers and the coldest winters but not too much in between. It’s time I went shopping for some in between outfits, and for that a cardigan is perfect. It’s a versatile piece that every woman should have in her wardrobe all year round, regardless of her age, shape or size. After looking around online, I’ve found some perfect cardigans from La Redoute. For those days where its too hot to wear a coat but too cold to go without or where a bulky coat may be a little obstructive, then a thick, cardigan like those at La Redoute make a great alternative. 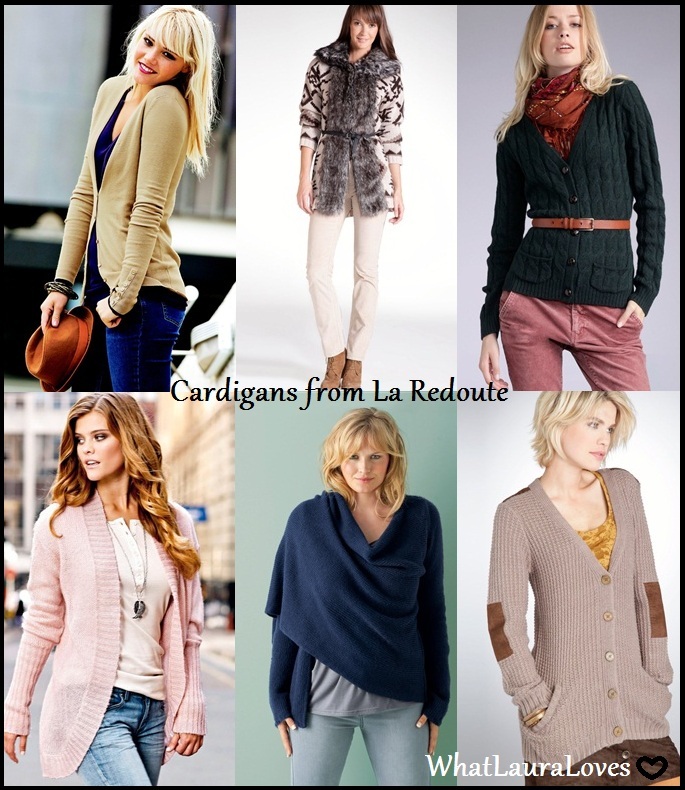 I absolutely love the Jacquard Cardigan from La Redoute (top row, middle photo) as its thick enough to wear as though it were a coat and the fur makes it look absolutely gorgeous for the winter time. Wearing a belt with this type of cardigan helps to define the waist and keep the wearers shape. A cardigan is also a great layering piece and can add warmth to an outfit without adding bulk or weight. I particularly like taking both long and short sleeved thin cardigans (top row, first photo) on holiday or when I’m going out in the summer as I tend to carry it in the early evening, then I have it there to pop on when the temperature cools down at night. Cardigans as also great to wear as a cover up over the top of a dress if you don’t like your arms or if you’re somewhere that it is disrespectful to have your shoulders on show, like in church. Cardigans make great work wear too as when worn with a pencil skirt or suit trousers, they make a much more feminine outfit than a suit jacket. As a rule of thumb, cardigans tend to look more causal if they’re lose and more dressy if they’re pulled in at the waist with a belt, this also has a slimming effect. For an ultra slimming look, opt for a light coloured dress or skirt and top, with a darker cardigan cinched in at the waist with a skinny belt. A crewe neck cardigan (i.e. the neckline that you would see on a standard tshirt should the cardigan be buttoned up) will give you a more chic look and if you’re looking for a to the preppy style then try wearing a wardrobe staple cable knit cardigan (top row, third photo) or an argyle patterned cardigan in a v neck; think Gossip Girl. For those days when you’re looking for something that’s quick, relaxed and casual, a shawl collar open style cardigan (as in bottom row, left) or a wrap around scarf style cardigan (as in bottom row, middle) is perfect. Wear with jeans and a skinny tshirt or vest top for an outfit that looks casual but still put together. If you’re wearing a top that has a print then I think its best to choose a colour in the print and match your cardigan to that colour. The cardigan will help to bring out that colour in the top. The same goes for if you’re wearing a patterned cardigan; choose a colour from the pattern, a more neutral colour looks best, and then wear a top underneath the cardigan in that colour. To jazz up a plain cardigan, look out for broaches or pins to add a little bit of sparkle. 2011 saw the trend of patches on cardigans and it doesn’t look set to go in 2012 either. I love this one from La Redoute (bottom row right) with the sudette patches on the elbows and shoulders as it adds a contemporary twist on an otherwise plain cardigan, with an additional colour too. Top marks La Redoute! La Redoute offers also an opportunity to save extra money just by entering a promotional code. Check this website about the promo codes and get the reduction instantly at the LaRedoute checkout page. What is your favourite cardigan? Do you like my top picks?